Clean Machine - Pure Water Window Cleaning Systems, Scrubber Driers, Sweepers, Carpet Cleaners, Industrial Vacuum Cleaners, Steam Cleaners. Clean Machine specialises in hire and sales of domestic, commercial and industrial cleaning equipment, especially floorcare and pure water, waterfed pole (wfp) window cleaning systems. Our extensive product range includes wet or dry carpet cleaners, hard floor cleaners for natural stone, vinyl, safety floors and concrete warehouse floors. We also have specialist products for outdoor floor cleaning, including patios, carparks and tennis courts. Craftex Thermadry rotary hot pad system. Host environmentally sound Green Seal cleaning chemicals. Cleanline, IVO, Tomcat and Powr-Flite floor scrubber driers and rotary floor machines either mains powered or battery powered. Kersten, Tomcat and Topfloor sweeping machines petrol engine and battery powered. Small Henry vacs to very large 3 phase industrial vacuums. VAX, Sebo and Morphy Richards domestic vacuum cleaners. 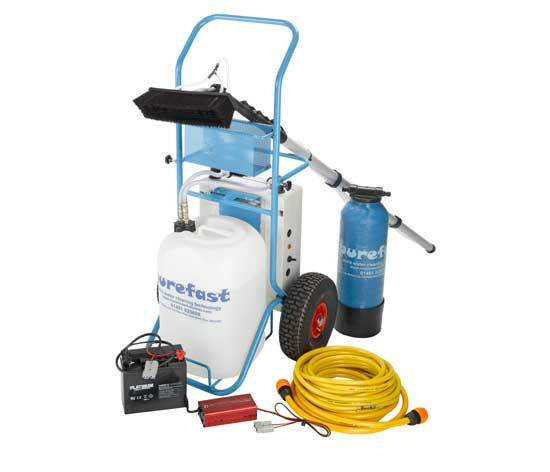 Dual Pumps, MAC International and Kranzle hot and cold water pressure washers. Whirlaway rotary surface cleaners, turbo lances and extending lances. Matrix dry steam cleaners which are designed to thoroughly clean and sanitise most hard and soft surfaces. They are used in kitchens, bathrooms, changing rooms, on floors, walls, machinery and furnishings, dry steam cleaners use high temperature steam vapour to sterilise and loosen dirt and grime. We manufacture and supply the very latest Pure Water Water Fed Pole (WFP) Window Cleaning Systems, including our own purefast trolley based pure water systems and our unique Glasshopper indoor high level cleaning system. We also hire, supply and install van mounted systems from 250 litres to 1000 litre capacities and fully automatic Reverse Osmosis static systems too. In our shop we stock Streamline and Unger products and lots of brass, stainless steel and plastic fittings and couplings. Also Unger and Lewi hand tools and spare parts, which many of our customers find extremely useful when they have lost or broken an item ! We also supply and install water softeners for domestic and commercial use. Our most popular commercial / industrial softeners are installed to soften water passing through reverse osmosis filter membranes which are used in pure water systems. Greatly extending the life and efficiency of the membrane. We match the size ( or capacity) of the softener to the amount of water used on an average day to ensure the effectiveness of the softener. Our domestic softeners are designed to give you water that feels soft and silky, it does away with unsightly scale around the bath, sink, taps and toilet and reduces the use of cleaning products, shampoo and soap. Soft water also maintains scale free pipes and can save up to 24% of the cost of running a heating system. From the day you install a water softener it will reverse the old scale build up from the last 20 years.